It was a perfect cozy spot for a weekend ski trip. Thank you!! 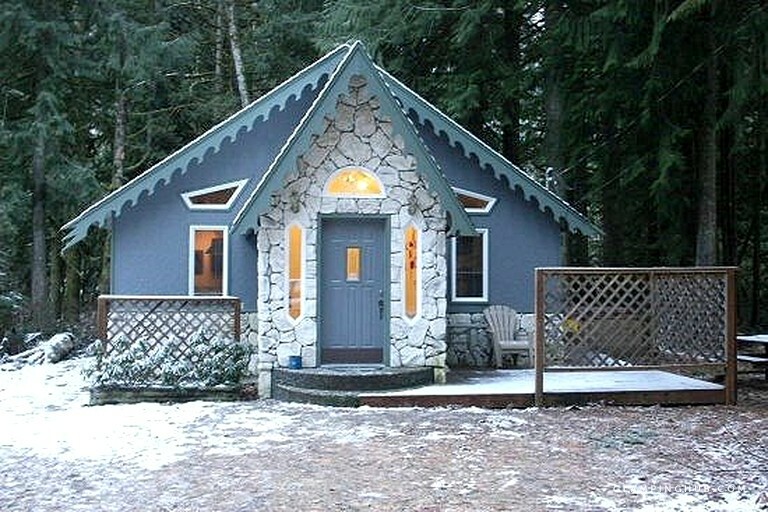 Glampers who are planning a couples retreat, but want to be within reach of the outdoor activities available in the Mt. 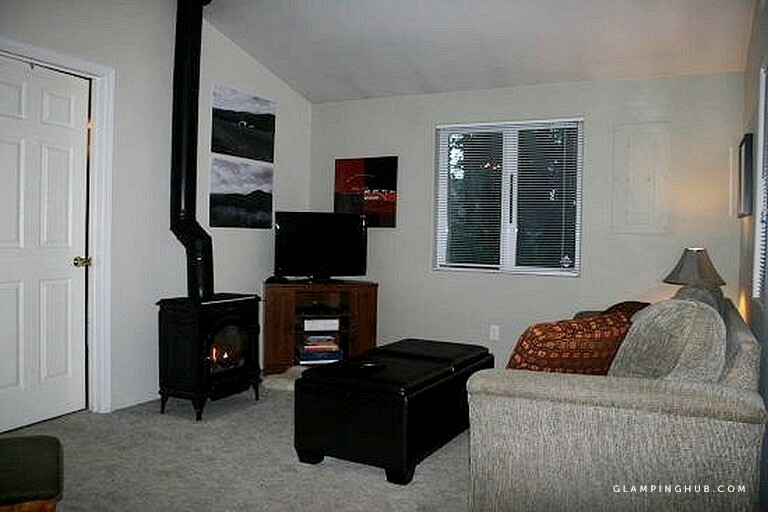 Baker Ski Area, need look no further than this charming blue cabin rental. 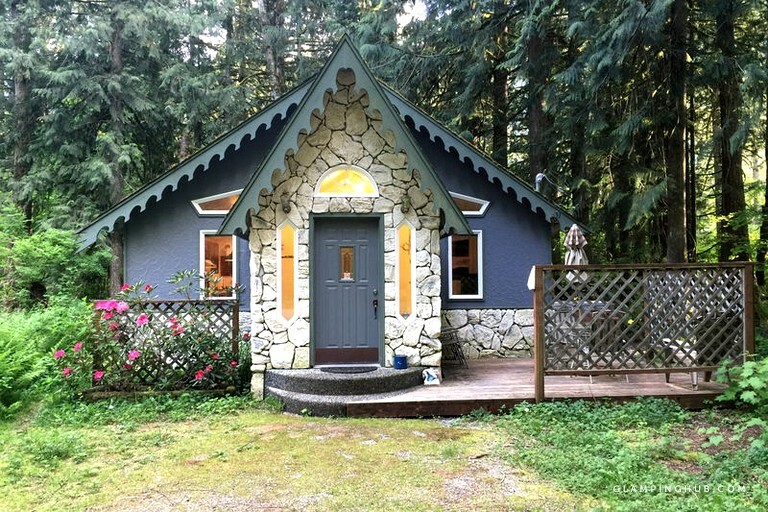 The one-story property is surrounded by birch trees and features one bedroom with a king-size bed and a large three-quarter bathroom with a double shower. 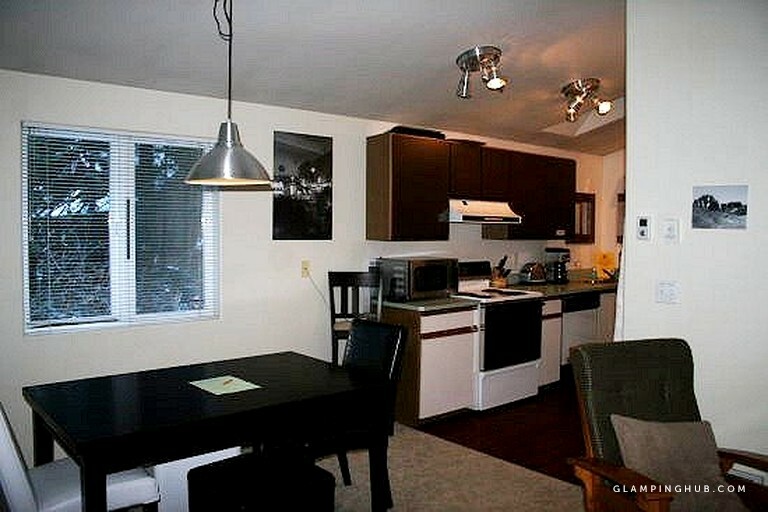 The kitchen is modern and fully equipped with everything to make a home-cooked meal. 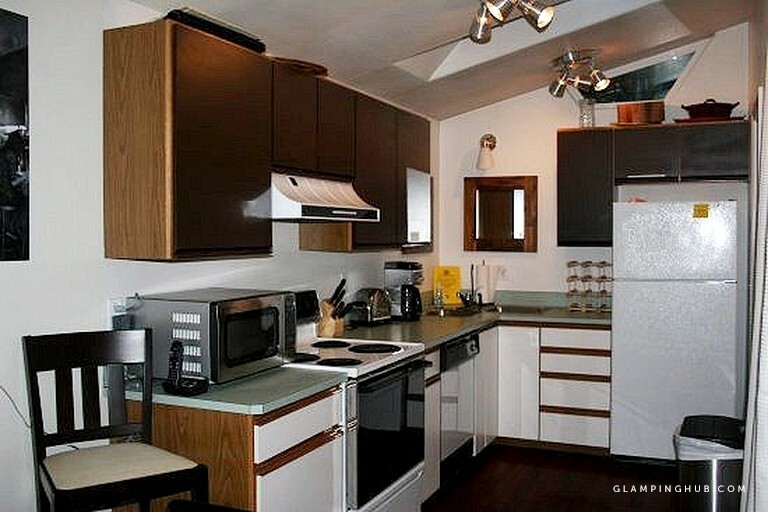 It is furnished with a microwave, a toaster, coffee maker, and a dishwasher to make life that bit easier. 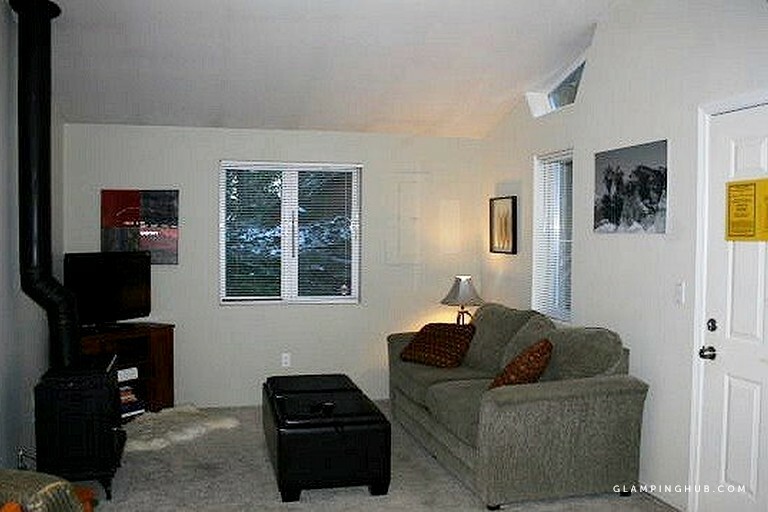 There is a laundry cubby with a washer and a dryer, and an open living/dining area with a freestanding gas fireplace. This charming cabin has its very own outdoor private hot tub, which is the perfect place to take in the woodland surroundings or relax after a day on the slopes. In the summer months, glampers are invited to make use of the gas grill. 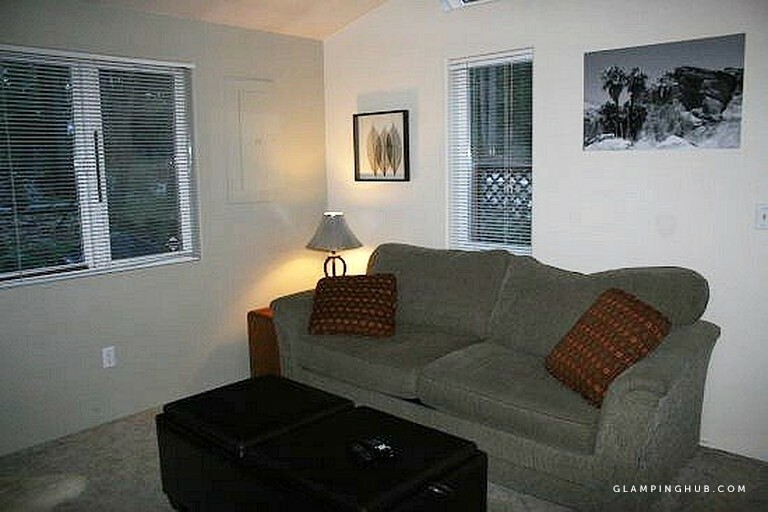 There is enough parking for one vehicle, and the property has Wi-Fi throughout the cabin, provided free of charge. The host offers a broad spectrum of cleaning services, personally customized for each glamping client. The provide move-in/out cleaning, vacation rental cleaning, spring (deep) cleaning, and even special event cleaning. 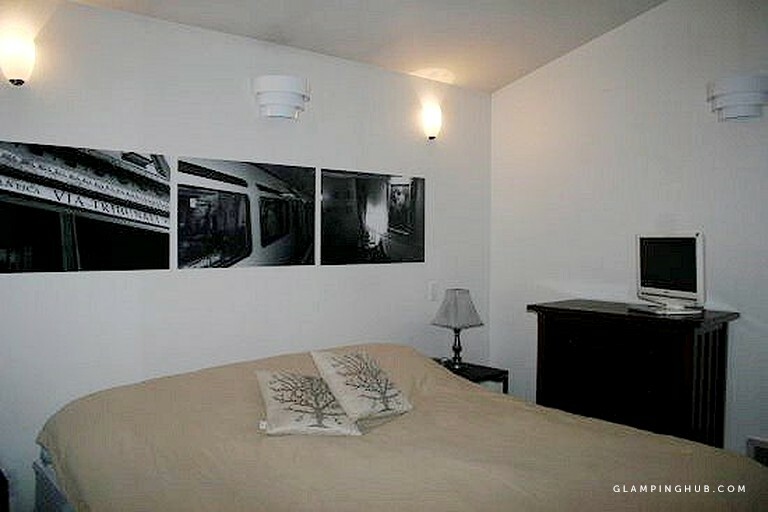 The standard cleaning rate for this property is $57. Outdoor adventurers will be spoiled for choice at this glamping cabin. The most popular activities for the area include hiking, rafting, skiing, snowboarding, snowshoeing, swimming, and fishing. The Pacific Crest Trail runs through the Mt. Baker area, convenient for glamping hikers, and Wild and Scenic River Tours will set up a blood-pumping afternoon of river rafting upon request. Rafting will take place on the Nooksack River, which is also where guests can go fishing, if they so choose. Guests who seek peace and relaxation, can enjoy a picturesque tour by car along the Mt. Baker Highway Scenic Byway, and a glass of champagne in the hot tub. This is a non-smoking accommodation, and is not pet-friendly. Please note that the Wi-Fi service is occasionally subject to intermittent service failure, which is beyond the hosts' control, and no refunds can be provided if this free Wi-Fi service fails to function momentarily.